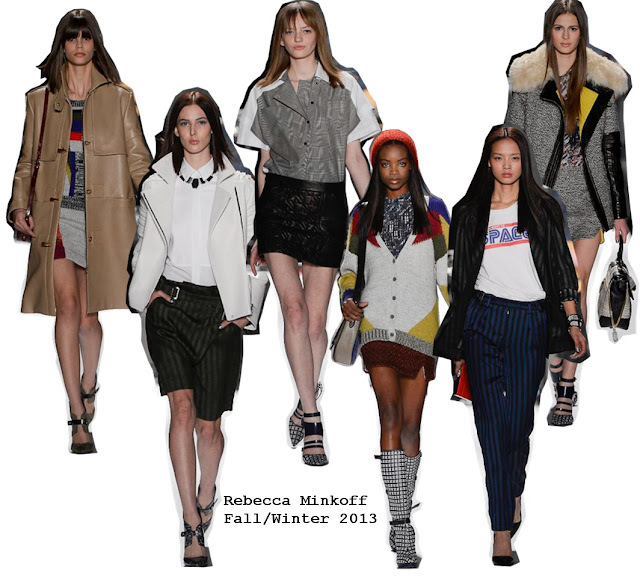 Rebecca Minkoff is the girl everyone wants to hangout with. It�s rare to find a designer who portrays who she/he really is. Most designers take inspiration in their collection to market their brand. Rebecca�..she�s someone else. She doesn�t need models to wear her clothes, because what she wears is enough statement. Her signature is written all over her design! Her fall 2013 collection was again, outgoing and flirty for this fall mood. Who said fall had to feel so depressing? Striped navy pants were so chic, no coat was needed. Shades of gray tweed uplifted the cold weather. There was a camel colored trenchcoat that was to die for. Skirts came with textured that grasped eyes to the details (and something else). Fur was crafted so well that it became cool; not too exaggerated, just the right touch. Shoes! You need to go get a pair ASAP. If there is something you need to know about this designer��are her bags. They add an incredible look to any outfit you decided to wear. P.S. : Rebecca Minkoff handbag prices are not over the sky. This should be your excuse to go out and buy one to look fashionable and trendy.